it's way into our house. They are not sure they like this use of their good name. 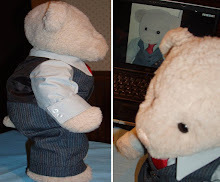 I was reminded of the extensive campaign Bob T. Bear launched against Charmin, a several years ago when the company was printing pictures of bears on their toilet paper. I was telling them about that when I noticed that Ping was wearing my new boots! Ping is a pretty sneeky panda. I'm sure he thought I wouldn't notice as they are black like his feet. 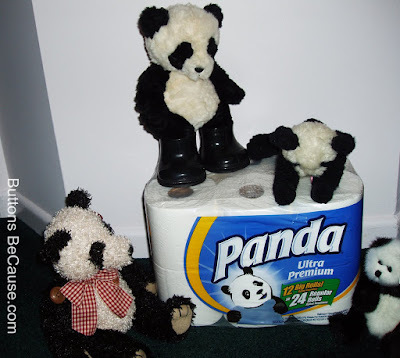 We decided to examine the package to see if the company perhaps makes a donation to some sort of fund to benefit Giant Panda's. Ping is happy that at least, there aren't any pictures of pandas on the toilet paper itself, only the package. After reading the package we conclude they are not. We read that they are energy and environmentally conscience. What do you think? How do you like my blog's new look? 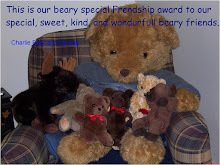 My bearsonal web-gerus are still tweaking a few things, but I couldn't wait. I have two pandas living with me, Roseclaire and Ming! They are also wondering what pandas have to do with toilet paper! I like the new layout of your blog! And those panda's are lovely! The only hamster thing I saw was at Sullivan's blog when his owner had beer with a hamsterpicture on it! Beautiful new look to the blog, Buttons. It's soft and serene, like sitting on an ocean's shore. Oh wait, you are. Mucho Kudos on the makeover, especially because one of your Tech Team Gurus is my highly talented son! We have a panda called Kiron living with us too. We thaks your support in that bad situation. - The ashes of the volcano in Icelang arrived only to a part of Spain, but the day taht the fish dies were clouds of rain. Barcelona's airport closed only one day for the ashes, but southern Spain and Canary islands weren't affected by the ashes.